Made in Côte d'Ivoire, Côte d'Ivoire, Africa, c.1950. 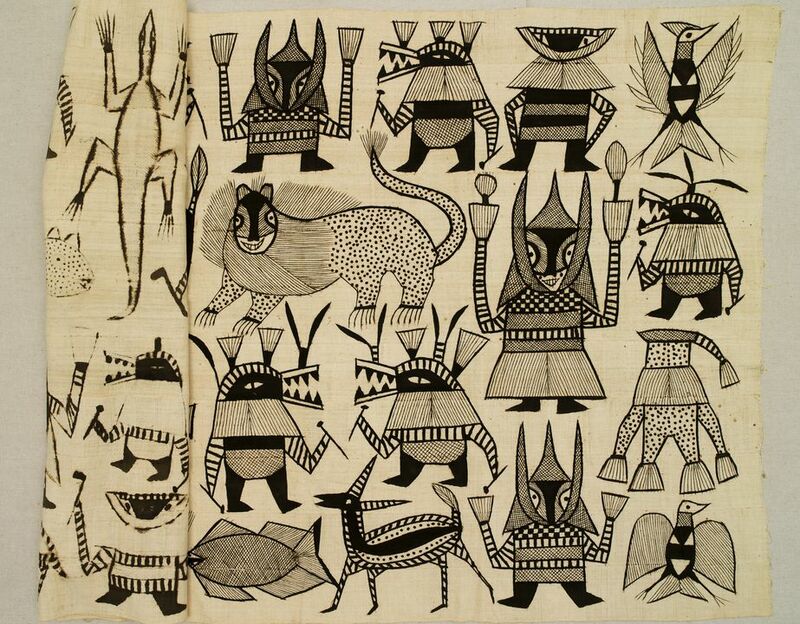 Korhogo cloth made in eleven narrow strips machine zig-zagged together depicting thirty-one mud decoration creatures. This pictorial mud cloth is made from hand-spun yarn woven into eleven strips machine zig-zagged together. Traditionally, the mud decoration was produced using the application of two natural dyes. The first of these is made from boiled leaves and is greenish-yellow in colour and the second is formed from decayed swamp mud extracted from the roots of trees. An iron-bonding agent in the mud is said to cause the dye to interact with the coarse fibres and thereby create a permanent colour. The mud decoration is hand painted onto the cloth using a stencil. More recently, however, black ink is used in place of the natural dye and machine-woven fabric is used in place of natural cotton. Korhogo cloths, like this, were made and worn by the Senufo people from the Ivory Coast in West Africa. Korhogo is a district in this area which is believed to be the origin of the cloths, although they are also made and sold for markets in Nigeria and Ghana. This particular textile was donated to the Museum from the private collection of Dr John Yu and Dr George Soutter, who purchased the cloth from a French dealer in the area of Rue des Beaux Arts on the Left Bank of Paris in the 1990s. .